If all the young men of England leapt off a cliff, Madeline St. James wouldn't care. Then she'd have peace. Her nightmares of courtship would end,and she'd cozy up with a Psalm in her aunt's quiet sculpture garden. Yet, a chance meeting and a bullet wound change everything, and Madeline must trust the Good Shepherd has led her to the altar to marry a dashing stranger, Lord Devonshire. Death and pain are no strangers to Justain Delveaux, Lord Devonshire, and he vows his dutiful bride will be kept safe and in her place. Though this compromised marriage is in-name-only, his wife and her unwavering faith both intrigue and allure him. Perchance when he thwarts his brother's killer, Justain will tempt the unpredictable Madeline with the comfort of his arms.But can Madeline and the stubborn earl forge a true bond before the next disaster strikes? I adore Regency times with its conflicts between Church and State, the clash of the classes, and the sweeping romances. My mission is to have the world fall in love with powerful Regency heroes and heroines who battle for peace with a flintlock and a prayer. Tell us a little about yourself. I am a very southern girl who loves to stay busy. I have an active eight-year old artist and wonderful active duty husband. We live in Georgia and from my porch, I get the best views of trees and pollen. What was your motivation behind this project? 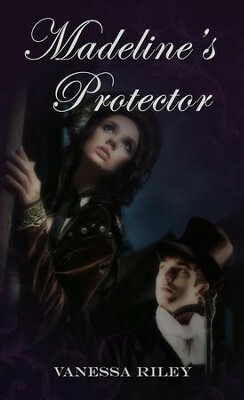 Madeline's Protector was a dream I had in high school. I remember having Regency overload. I had just watched Lawrence Olivier's and Greer Garson's black and white movie version of Pride and Prejudice, wrote a paper on Jane Austen's Pride and Prejudice, and read some new marriage of convenience novel. The dream was vivid, and I wrote it as a short story. Years and years later, I picked up one of my old writing diaries, found the story, and started rewriting it. What do you hope folks will gain from this project? It's all about faith. I hope to challenge my readers by placing my characters in distressing situations and showing how God can leads them to fulfillment. God is available to help and make you a better angel. How were you personally impacted by working on this project? My faith has deepened as I see God growing my abilities and creating a wonderful story. Who are your influences, sources of inspiration or favorite authors / artists? My favorite Regency authors are Jane Austen and Georgette Heyer. I love their wit and how they test the societal norms while staying true to how people thought and acted during those times. Now for Miss Austen, it was easier. She lived during those times. All the Regency writers that have followed must do a lot of research to master the culture. I applaud them. Current day authors that I adore are Debbie Raleigh (A Proper Marriage, A Convenient Marriage) and Laurie Alice Eakes (Lady in the Mist, Necessary Deception, and A Flight of Fancy) and Linda Winsor (Wedding Bell Blues and The Knight and the Raven). Anything else you'd like readers / listeners to know: I will say at least one character in each book has the tendency to use a Biblical allusion, which is something I love. Growing up I loved bible stories, the older the better. So, if you see something like the Prophet and the Courtesan, it's probably a Regency take on Hosea and Gomer.